The Las Vegas-based conference is drawing nearly 1,900 independent reps and over 70 prospects. Raymond James Financial Services (RJF), the firm’s independent channel, is hosting the group’s annual conference this week in Las Vegas at the Aria Resort. Attendance is at record levels, the company says, with some 3,070 registered individuals, including sponsors and staff. Close to 1,900 of the roughly 3,380 independent advisors affiliated with Raymond James are attending the educational event, along with more than 70 prospective reps.
“Our national conference provides a once-a-year, five-day opportunity to meet and network, learn from industry thought leaders …, share ideas and best practices, fulfill CE requirements and have some fun,” said Scott Curtis, president of the group, in a program for the event. “This year’s conference theme is Elevate. In each educational session, the focus is on helping you elevate your business success, your client and business relationships and your personal health,” Curtis explained. The event’s keynote speaker is business consultant John Spence, who addresses the group on Wednesday afternoon. Earlier in the day, Jeff Saut, Raymond James chief investment strategist, will give an outlook on the global markets. 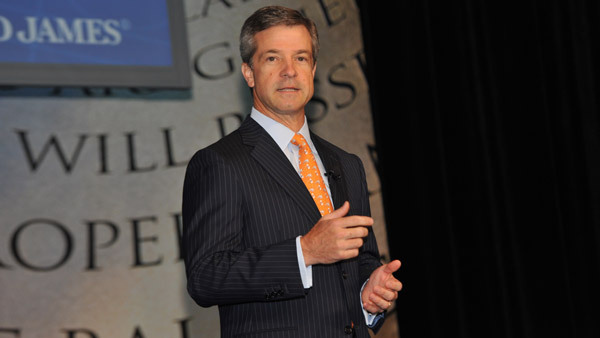 On Thursday, Raymond James CEO Paul Reilly will meet with the advisors and will lead a town hall discussion. Innovator and philanthropist Doc Hendley, founder of Wine to Water, will share his story, as well. A five-kilometer “fun run” takes place Monday afternoon, while a charity golf tournament is scheduled for Friday. The company releases its financial results for the quarter ending March 31 after the markets close on Wednesday. In the prior quarter, Raymond James beat estimates with an 8% jump in net income. Net sales for the Private Client Group were $845.2 million, a jump of 8% from the year-ago period, but a 2% drop from the prior quarter. Pre-tax net income for the unit totaled $92.7 million, a 30% improvement for a year ago and a 7% decline from the earlier period.